NAYPYITAW — About 32 percent of Myanmar’s 50 million population, or 15.8 million people, are living in poverty, according to an assessment of the 2015 Myanmar Poverty and Living Conditions Survey. 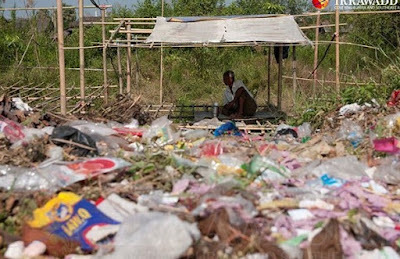 The new report, compiled jointly by the Ministry of Planning and Finance and the World Bank, is the second of the two-part Myanmar Poverty Assessment and was launched in Naypyitaw on Tuesday. Of the 15.8 million people living below the poverty line, 13.8 million are in rural areas. Poverty has declined significantly since 2004, falling from an estimated 48.2 percent to 32.1 percent in 2015, according to the report. However, beyond the 32 percent living below the poverty line, a further 14 percent are near-poor, living within 20 percent of the poverty line, the report adds. The second report defines the poor as those who cannot afford a basket of goods that captures basic minimum needs. The earlier report released in August measured poverty based on basic minimum needs using consumption patterns from 2004-05. According to the second report, poor households tend to have fewer working age adults, more dependents and fewer resources that can generate income, such as land or farming tools. The extreme poor are disproportionately in the agriculture sector as casual laborers or smallholder farmers and have few alternatives for income. Malnutrition, high infant mortality and poor-quality education limit the physical and cognitive development of children from poorer households. Only a third of households have access to electricity from the public grid and nearly 3 in 10 people lack access to clean drinking water throughout the year. “Having a more detailed understanding of the characteristics and profiles of those most in need and the constraints they face enables us to prepare appropriate responses and help reduce poverty for everyone in Myanmar,” said U Maung Maung Tin, director-general of the Planning Department at the Ministry of Planning and Finance. The poverty assessment is part of a series of analytical works outlined in the Country Partnership Framework, the World Bank Group’s first full strategy for Myanmar in 30 years. The strategy supports reforms that promote growth in rural areas and invest in services that work toward better nutrition, health, education, infrastructure and more jobs.